My godson Bear got a few days off school this week, and Mrs. Tigger decided to take him for another trip to Hong Kong Disneyland. She invited me to come along, and being the dutiful godfather that I am, I figured I'd take the afternoon off and join them. When I arrived at the park, Bear was waiting to take pictures with Donald and Daisy - who were dressed as jack-o'-lanterns. We were soon picked up by our guide, who would accompany us on our three-hour tour. Now, Mrs. Tigger has obviously taken Bear to Disneyland many, many times. So why would they need a tour guide, you ask? 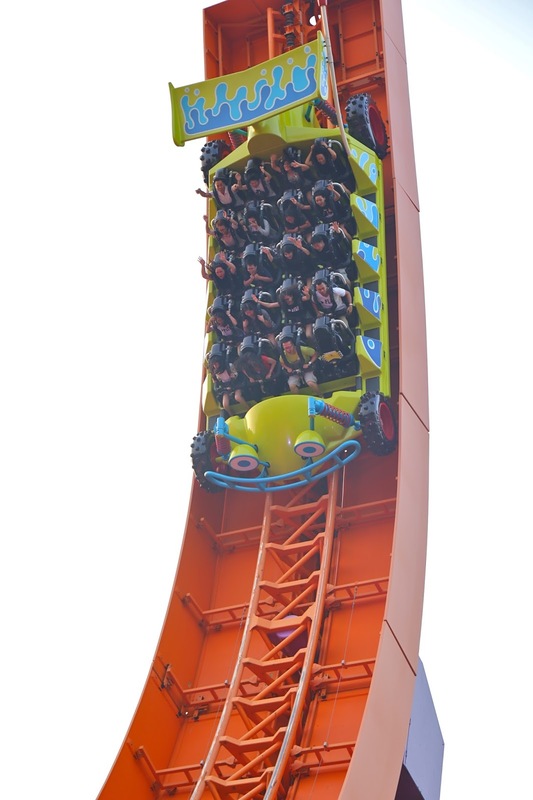 Well, for the tidy sum of HKD 4,688, the guide will spend three hours with you and take you anywhere you want, while enabling you and five of your friends to cut to the front of the line on any ride or any show. We entered through the exits and side doors of every ride, jumping in front of just about everyone else who was waiting in line. That was pretty damn sweet! As our tour started at the same time that the Flights of Fantasy Parade, and this was something that Bear absolutely loves, we hung around Sleeping Beauty Castle to watch. It was obvious that in spite of his recent fondness for Batman, Mickey is still his best friend. After a while we decided to start our tour. Not surprisingly the Cinderella Carousel was our first stop, and I jumped on a horse in front of Bear so I could film him. We moved into Tomorrowland and did some target practice at Buzz Lightyear Astro Blaster, but I only got to Level 3... Bear and his new best friend rode on the Orbitron, then I joined him and Mrs. Tigger driving around in Autopia - which turned out to be a tad boring. Since Bear no longer wants to go on the Space Mountain ride with his mama, she roped me into riding with her. I think it's been more than a decade since I last rode on a roller coaster, and I had a lot of fun sitting in the front of the car. We crossed into Grizzly Gulch so that Bear could take his very first ride on the Big Grizzly Mountain Runaway Mine Cars - now that he was finally tall enough! Bear and I rode in the very front, and I could see he really loved the ride. I was happy to have shared this experience with him. Mrs. Tigger, Babu, and I went through Mystic Manor together, where we found that the vehicles were not set on rails. Instead, their movements were controlled through a Wifi network. That was pretty cool. Once we crossed into Toy Story Land, I decided I had had enough rides for the day, and would just hang around and film the rest of the family. Bear went on the Toy Soldier Parachute Drop, which is a ride he likes.